Currently, there exists no functional dialog editor for PARPG. While the syntax of the dialog YAML files is arguably straight forward, editing raw text can be intimidating. Furthermore, a tool to help facilitate the creation of these files would speed up their production by making the editor's work flow more efficient. The tool I have in mind wouldn't simply cater to a specific style of editing, but to an array of different styles. source: In this mode, the content panel will show a hierarchy of objects present in the source code. Clicking on one of these objects will jump to the corresponding line of code. Chart: In this mode, the content panel becomes a toolbox, with icons representing dialog sections, those sections' responses, and arrows that dictate the dialog's flow. Table: In this mode, the context panel will show a hierarchy of dialog elements, such as section names and those sections' responses. By clicking on a section, the selected section is scrolled to in the main view port and highlights all of the sections that could potentially follow the selected one. Clicking on a response would scroll to that response in the main view port and highlight the section that follows that response. C: This is the main view port. depending on the view selected (denoted by tabs above), the content will change (see: Editing Modes). 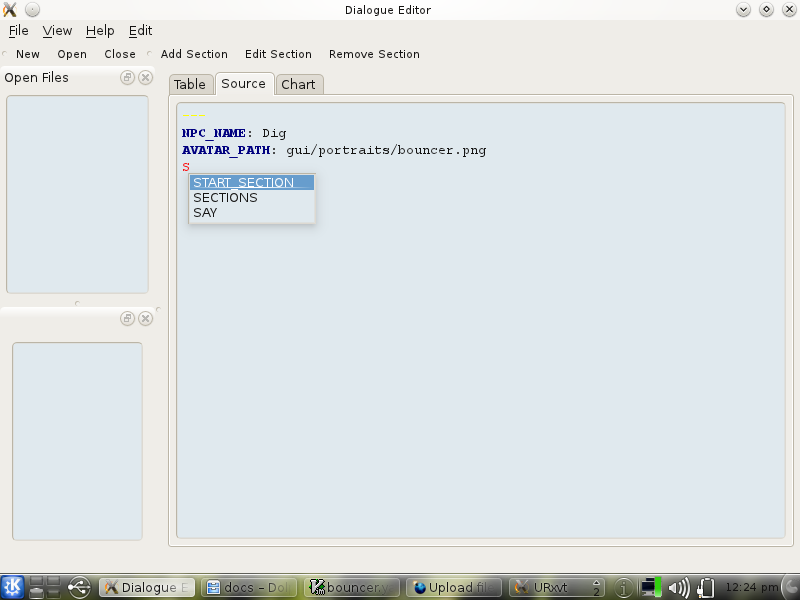 This section will cover in brief detail the three main modes (or styles) of editing dialogs. This mode will resemble closely the current style of editing dialogs. As with many editors, this mode will present the raw YAML file to the user with syntax highlighting, line numbering, and automatic indentation. Unlike existing editors, this mode will offer auto-complete and quick access to help. 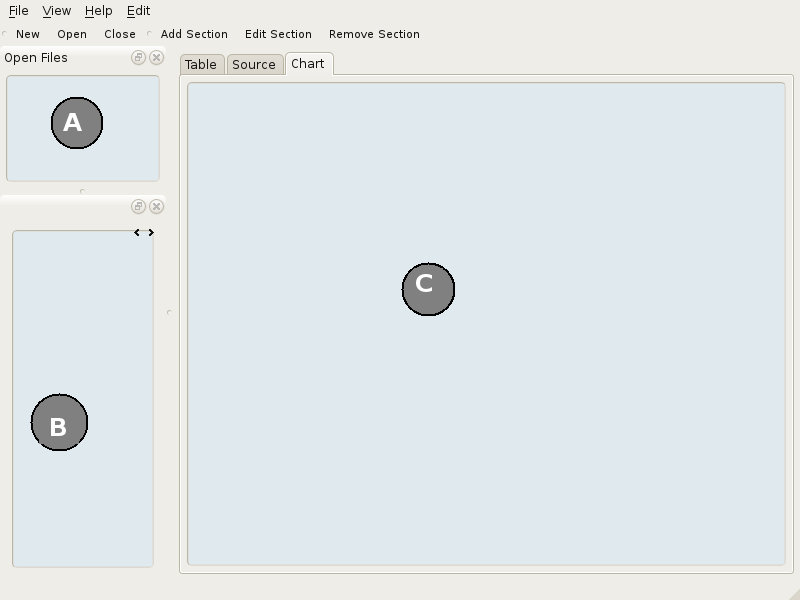 Chart mode will provide the user with a graphical representation of the current dialog. By dragging and dropping the appropriate icons, dialog sections and their respective responses should be a snap to create. To change the flow of a dialog, a user would then need simply drag arrows to the section to follow that response. This mode is a bit difficult to explain. Once development progresses a little further, it should be easier to expound upon this by showing the mode in action. This page was last modified on 9 June 2011, at 00:53.